America’s Got Talent is continuing with its dreaded Judges’ Cuts round! So far this season, each judge has invited a special guest to assist the panel in making these difficult decisions. Two weeks ago, Howard Stern brought in Neil Patrick Harris to kick off the festivities while Heidi Klum recruited Michael Buble to help the panel evaluate this year’s talent. 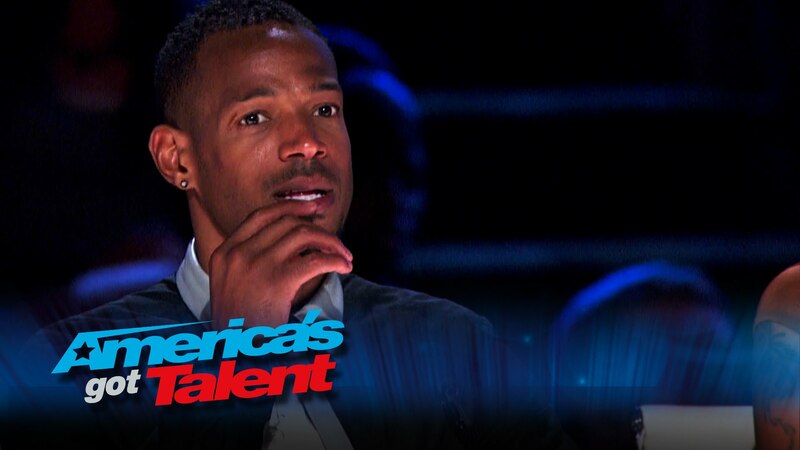 This week, AGT stalwart Howie Mandel invited comedy icon and I Can Do That host Marlon Wayans to join the panel! Just like NPH and the “Home” singer-songwriter before him, Marlon has the power to use the Golden Buzzer on an act that he likes. By hitting the Golden Buzzer, that act will immediately join comedian Drew Lynch, dance duo Freckled Sky, opera protégé Arielle Baril, gospel singer Sharon Irving, comedic magician Piff the Magic Dragon and singing duo Craig Lewis Band at the Radio City Music Hall live shows. Up first to the face the judges and Marlon Wayans was vocal trio Triple Threat! They are out to take One Direction’s crown as “the hottest pop band in the world.” The Arkansas trio tackled an acoustic cover of Ariana Grande’s “Problem” that sent the audience into a screaming frenzy! Marlon called them “three little nerdy white boys,” but enjoyed their presentation. Howard added that they could blow all the boy bands away with talent, but was worried about if they would make it. The dance category was packed tonight! Multiple dance acts took the stage! While several acts disappointed me, other troupes stepped up to the plate. The Squad delivered a great routine that would impress the SYTYCD judges to Fifth Harmony’s “Worth It,” while the Animation Crew brought their unique twist to the Jackson Five’s “I’ll Be There” that received a standing ovation from Howie and Marlon. In addition to the dance acts, it was a duel of the singer-songwriters. In one corner, Johnny Shelton…. who at his first audition captivated the audience with a song dedicated to his dead son. While he looked like a hybrid of Will Champlin and Matt McAndrew, his voice on “The House That Built Me” gave me goose bumps. Heidi was extremely touched by his act, while Mel B thought called this performance: “pitchy.” Howie ended the feedback by saying that Johnny touched their souls with his voice. In the other corner, bar singer Benton Blount, whose family was rooting for him in the audience! This marked the first time that he performed in front of his two-year-old son. I loved his cover of Dolly Parton’s “Jolene” and I think the Queen of Country would love his rendition! One of the highlights of the night was mentalist Oz Pearlman’s second audition. Viewers might remember that he focused on Heidi and Mel B during his first audition; tonight, he targeted both Howard and Howie. Using specialized notebooks that contained the names of some of the most recognizable women (Howard) and male movie stars (Howie), Oz asked them to pick a name from each of them. The 32-year-old New Yorker correctly picked out Oprah Winfrey and Tom Cruise respectfully. Not only was his trick out-of-this world, but he also received a standing ovation from Howard, Heidi and Howie! Ventriloquist Paul Zerdin brought a baby into his second audition. This baby wanted Paul to tell a story. I loved his material, the remix of Little Red Riding Hood and the wet ending! Howard declared that Paul would be a main contender and Marlon loved him so much…. that he gave him the Golden Buzzer! While Johnny Shelton was wrongly eliminated from the competition (go audition for The Voice, Johnny), Benton, Triple Threat, Oz Pearlman and Animation Crew joined Paul, Vita Radionova and Mountain Faith Band at the Radio City Music Hall live shows! Don’t miss tomorrow night’s AGT’s 10th Anniversary special! Next week, original judge Piers Morgan returns to assist the judges in the final week of Judges’ Cuts!